It's All Relative: Notify... oh, wait! I have a signal. Notify... oh, wait! I have a signal. When you want to pipeline, delegate some task asynchronously or simply synchronize 2 threads, you usually end up using wait/notify couple (or even await/signal, depending on your taste). But what is the cost or the overhead for this kind of pattern ? What happening when we are using wait/notify couple ? For Object.notify, we ask the scheduler (via futexes on Linux) to move one of the waiting threads from the wait queue to the run queue to be scheduled when possible. Just a quick remark about system calls: contrary to the common belief, system calls do not imply context switches. It depends on the kernel implementation. On Linux there is no context switch unless the system call implementation requires it like for IO. In the case of pthread_cond_signal, there is no context switches involved. Knowing that, what is the cost of calling notify for a producer thread ? Why not building a micro-benchmark ? Because I do not care about average latency, I care about outliers, spikes. How it behaves for 50, 90, 95, 99, 99.9 % of the time. What may be the maximum I can observe? This code basically creates n pairs of threads: one (critical) which trying to notify the second (flushing) that data are available to be processed (or flushed). I run this code with following parameters 16 1000. It means that we have 16 pairs of threads that doing wait/notify. So most of the time we can observe couple of microseconds for a call to notify. But in some cases we can reach 50us! For Low Latency systems it can be an issue and a source of outliers. A notify call can take 1.6ms! Even though there is no contention in this code per se, there is another kind of contention that happens in the kernel. Scheduler needs to arbitrate which thread can be run. Having 256 threads that trying to wake up their partner thread put a lot of pressure on the scheduler which become a bottleneck here. 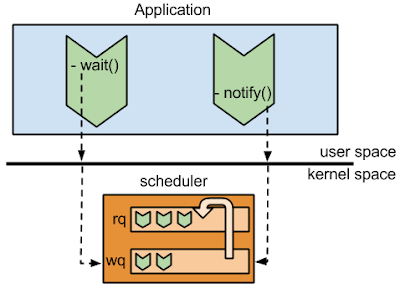 Signaling can be a source of outliers not because we have contention on executing code between threads but because the OS scheduler needs to arbitrate among those threads, responding to wake up requests.